Up to three-quarters of fish sampled from the River Thames have been found to have plastic fibres in their gut. The Royal Holloway study was small and looked at just two species - but it highlights, say scientists, the pressing issue of plastic waste in London's great waterway. The Port of London Authority (PLA) has launched a campaign to raise awareness of the curse of litter. 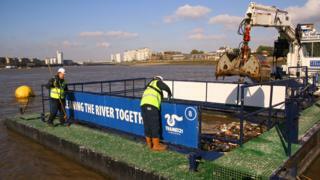 It wants public support to stop plastic from getting into the Thames. The PLA has teamed with other groups, including the charity Thames21, to ask people to "Do The Right Thing" and make sure any rubbish they have goes securely into a bin. "This is not just a problem along the river; it's affected by litter from across London," explained the authority's environment manager, Tanya Ferry. "So you might discard plastic near Buckingham Palace or Selfridges but if it gets into the drains, those drains could potentially discharge into the Thames and carry those plastic pieces with them." The PLA has 16 barges positioned on the river to catch floating debris. Called "passive driftwood collectors", these devices are increasingly catching plastic, not fallen tree branches. Some 400 tonnes of rubbish are being caught annually, and while that mass has stayed fairly stable over time, its volume has shot up, indicating that discarded plastic is on the rise. Media captionDr Dave Morritt: "Our study begs the question of just how much plastic is in the Thames"
Thames21's army of volunteers have been clearing the foreshores regularly for 10 years. They have noticed the change that is occurring. "In the early days, it was a huge mixture of stuff - metalwork, old fridges and supermarket trolleys," said the charity's CEO Debbie Leach. "We've dealt largely with these bigger items, and now what we find is that it is the plastic that keeps coming back - water bottles, carrier bags and, amazingly, cotton wool buds. We find millions of the plastic sticks all over the foreshore." On the day of the launch of the campaign, Bank of America employees had volunteered to clean up exposed muds at Greenwich. They were having to dig deep to get to the shopping bags, which had been buried in many centimetres of sediment. Of course, much of the plastic debris is not being caught or deposited on foreshores, and is simply sweeping out to sea to add to the well-documented problems of waste in our oceans. The litter that does stick around will eventually be broken down into small fragments and fibres by waves and UV light. Some of this will hang in the water column; some will get into the bed of the river. And it is this micro debris that can be ingested by fish. The Royal Holloway study examined common flounder and smelt from Erith and the Isle of Shepey. The flounder, which are bottom-feeders, had the most fibre in their gut. Up to 75% of these flatfish had plastic in them. The smelt, which swim in the water column, were contaminated in a fifth of cases. "And we also know from some of the other work we've done on Chinese mitten crabs at Chelsea Bridge that they have knots of plastic fibres in their stomachs," said Royal Holloway's Dr Dave Morritt. "So that's crabs and two species of fish. And those plastics seem to be a range of things, and include nylon, acrylic, polythene and cellophane." As well as the PLA and Thames21, the campaign is backed by Totally Thames, the Environment Agency, Thames Tideway Tunnel, the London Wildlife Trust and the RSPB. It will be running a series of YouTube videos over the next 12 months to explain the issues to Londoners and the capital's millions of visitors. These videos will be presented by the explorer Paul Rose, a recognisable figure from the many documentaries he has made for the BBC about the marine environment. Paul wants everyone to "take ownership" of their waste, and not - as he says he sees often - to try to stuff rubbish into over-full bins. "Put it in your pocket and take it home," he said. "I spend my life diving and supporting ocean science in the world's last wild places. And everywhere I go, whether it's diving in the Northwest Passage, as I was two months ago, or the Selvagem Islands, as I was last week - we take water samples, and they've always got plastic in them. We never take a sample that hasn't got plastic in it. "It's so hard to get the message across, but we have a great opportunity here to get people to understand this global problem." The PLA says it is talking to the riverside London Boroughs about getting them to join the campaign. "The point about bins being emptied frequently enough so that people are not sticking stuff in so that it immediately blows out - that's really important to get the boroughs on-side with," said authority chief executive Robin Mortimer.